Our Website Marketplace Clone script grants you the opportunity to finally start a online web marketplace just like the biggest online. We provide the complete PHP and mySQL powered back-end with a intuitive front-end allowing you to run your very own online marketplace! Our script comes with a nice web 2.0 feel to it for those who want a nice looking site right out of the box. The theme can easily be customized or replaced with your own design for a fully custom experience. Our script is easy to install with step by step on-screen instructions so that even the most inexperienced would have no troubles with getting the system installed. We strive for customer satisfaction. We want to make sure that you succeed with your marketplace using our software and to ensure this our customer support team will always be there for you when you need it. Our Website Marketplace Script is always being updated with new features and extra security measures making it once of the most secure and feature packed web marketplace scripts available today! We have different licensing options to suit your needs! This is our single user license which will last indefinitely. It comes with 1 year of free updates and unlimited support. After the first year you will need to renew the license if you wish to continue to receive updates and support for later released version. You will keep the license forever. The license can only be used to install on a single domain. The developers license grants unlimited rights to the script. 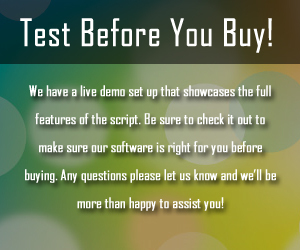 This version of the script does not include an encoded licensing system so you will be able to edit and modify the code to your liking. It will be allowed to install on multiple domains. This license comes with 1 year of support and updates. Renewal is an available option. This license does NOT grant you reseller rights of the script however. There is no review at the time. Our software will run on most Linux based platforms. Make sure your server or web host will have the following requirements otherwise the script may not be fully compatible when installed on your server or hosting account. 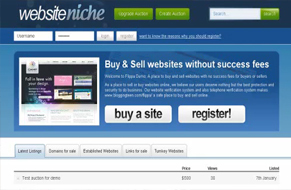 Your most complete Website Marketplace Clone Script - Start your own marketplace today! We had to change our domain name due to trademarks issues. Our product and support remains the same!